The story began in 1606, when a group of reform-minded Puritans founded their own church, separate from the state-sanctioned Church of England. Accused of treason, they were forced to leave the country and settle in the more tolerant Amsterdam. However, after years of struggling to adapt and make a decent living, the group sought financial backing from some London merchants to set up a colony in America. On September 6, 1620, 102 pilgrims–named by William Bradford who was another passenger who would become the first governor of Plymouth Colony–crowded on the Mayflower to begin the long, hard journey to a new life in the New World. On November 11, 1620, the Mayflower anchored at what is now Provincetown Harbor, Cape Cod. Before going ashore, 41 male passengers–heads of families, single men and three male servants–signed the famous Mayflower Compact, agreeing to submit to a government chosen by common consent and to obey all laws made for the good of the colony. To learn more about the significance of this document check out this archived Ashbrook podcast (session 1) recorded Saturday September 24th, 2005 by Professor Larry Schweikart. Jackie Earle Haley playing Alexander Stephens in Spielberg's newest movie. In the newest Spielberg movie, titled Lincoln, the Confederacy’s vice president makes a cameo appearance. Some of your students may not know much about Alexander Stephens. After I read a speech he gave in 1861, I decided that was all I ever cared to know about him. Known as the Cornerstone Speech, this document outlines the reasons for the secession of Stephens’ home state of Georgia and attempts to justify that action. In the middle of the speech, he happens across a theme that this blog has been concerned with lately: equality. Lincoln’s view of ad commitment to equality would be given high marks by most modern Americans. This was an important part of Spielberg’s latest film. Stephens, however, promotes the old ideas of antebellum racists (the contrast between the two men in Lincoln is striking). If you want your students to delve into this topic, have them read the Cornerstone Speech. If you want a shorter version that quickly gets to the heart of the issue of equality, see the excerpt pasted below. Ask your students to what extent Calhoun (see the previous blog) and Stephens agree. Ask them to contrast Stephens with Lincoln. It may even be useful to have discussion on how each man viewed the concept of natural law. Some context: when Stephens refers to “the new constitution,” he is alluding to the constitution of the newly formed Confederacy. On this day in 1918, President Woodrow Wilson arrived in France to take part in World War I peace negotiations and to promote his plan for a League of Nations, an international organization for resolving conflicts between nations. In an Edsitement lesson created by Professor David Krugler (University of Wisconsin-Platteville) students can study this event as well as the formation, application, and successes/failures Wilson’s foreign policy. Students will subsequently appreciate the profound legacy of Wilsonianism in U.S. foreign relations as they continue their study of modern U.S. history. On this day in 1787, Pennsylvania became the second state to ratify the Constitution, by a vote of 46 to 23. Pennsylvania was the first large state to ratify, as well as the first state to endure a serious Anti-Federalist challenge to ratification. If you didn’t already know, Professor Gordon Lloyd of Pepperdine University has created a website in collaboration with the Ashbrook Center for Public Affairs at Ashland University on the Ratification of the Constitution. Professor Lloyd organizes the content on the Ratification in various ways on the website. One lesson plan has been created to align with the content of the “in doors” conversations of ratification. There are four main component parts to the “in doors” coverage on the website. 1) A Commentary that breaks down the “in house” ratification into The Six Stages of the Ratification of the Constitution. 2) Elliot’s Debates is the major source for learning what took place at the various state ratifying conventions. 3) We have provided a day-by-day summary of each of the three ratifying conventions Massachusetts, Virginia, and New York. This summary highlights the particular clauses of the Constitution that were under consideration on that day along with a synopsis of the main points that were made by the delegates. Each of the three Day-by-Day Summaries is preceded by a brief overview of the entire ratifying convention. 4) A set of individual Maps along with a comprehensive map that shows the location of Federalist and Antifederalist strength throughout the thirteen states. A homely and somewhat terrifying visage of John C. Calhoun. Not every antebellum thinker saw eye-to-eye with Lincoln’s espousal of this principle, however. 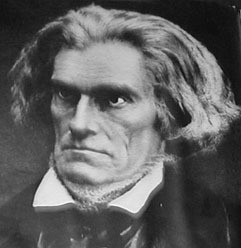 John C. Calhoun, a South Carolinian politician and latter-day states’ rights advocate, was one of the main proponents of interposition, nullification, and in extreme cases, secession. When the Senate debated on the topic of whether the U.S. should sign a treaty with Britain to share the Oregon Territory, Calhoun spoke at length. One of the issues that he happened upon during his discourse was the topic of equality. Have your students read his speech (it may be beneficial to truncate what lower-level students read, as the point is driven home early in this piece). Ask your students to consider how Calhoun understands the concepts of liberty and equality. Have your students hypothesize what Calhoun’s stance on slavery would have been. Ask what differences exist between Lincoln’s view of equality and Calhoun’s? Put in this light, all those who claim that Lincoln was not fully committed to black equality may tend to reconsider. In 1953, the Abraham Lincoln Association published The Collected Works of Abraham Lincoln, a multi-volume set of Lincoln’s correspondence, speeches, and other writings. Roy P. Basler and his editorial staff, with the continued support of the association, spent five years transcribing and annotating Lincoln’s papers. The Collected Works of Abraham Lincoln represented the first major scholarly effort to collect and publish the complete writings of Abraham Lincoln, and the edition has remained an invaluable resource to Lincoln scholars. Through the efforts of the Abraham Lincoln Association, the edition is now available in electronic form. Pearl Harbor Day is sadly fading from being commemorated in many U.S. classrooms. For students of the war the day still serves as an amazing event that truly placed the world into a war that would last for four more years and impact every continent. This interactive site from National Geographic illustrates the events of that infamous day in an extraordinary way. The previous installation of this blog focused on Lincoln’s view of the nature of the Civil War. Looking at his 1862 letter to Horace Greeley, one may come to the conclusion that Lincoln’s only purpose was to preserve the Union. There is more to the story, however. Later that year, Lincoln issued the Preliminary Emancipation Proclamation. In essence, this document declared that slaves held in the areas of rebellion would be freed upon the new year. Some may say that this proves Lincoln sought emancipation as a war goal–a goal that was as important to him as the preservation of the Union. Others may more cynically state that Lincoln had no desire to interfere with the institution of slavery. He only meant to free certain slaves in order to speed the war’s end. Therefore he was not dedicated to equality. Both sides have their proponents and merits. The study of another famous document that was produced after the Emancipation Proclamation was issued officially on January 1, 1863 may be instructive. 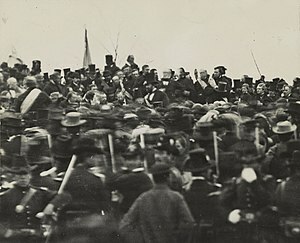 The Gettysburg Address is one of the most famous speeches in American–and perhaps world–history. But what does it have to say about the issue of the nature of the war? Have your students read this document carefully. Does the Gettysburg Address tell us anything about Lincoln’s view of the nature of the war? How does he frame the concept of “liberty”? What does he mean by “new birth of freedom”? Answering these questions may help shed a different light on the subject of Lincoln’s commitment to equality of the races.